What may seem like a very silly idea at first, may just turn out to be great when placed in the hands of creative and skilled people. Here is an example: let’s make a platform game for the Commodore 64, have the main character take the form of a little pink pig, have the swine leap further by farting, let the glutton eat to satisfy its tummy, have the pork chop candidate collect potties for the local witch so she can make a porcelain goddess and save the world… Well, that pretty much sums up the little platformer Quod Init Exit IIm from game developer Retream (link). 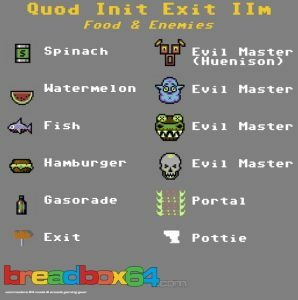 The IIm is short for secundus minimus and refers to this game being the short sequel to the highly acclaimed Quod Init Exit (link) which is Latin for ‘whatever goes in, comes out‘…. Quod Init Exit IIm is a 2D platformer, sporting an amazing graphics engine that pushes the C64 hardware to its limits and includes full screen gameplay, 50 frames per second, free-positional & sub-pixel scrolling, colorful high resolution graphics, background animations, smooth main character animation and a huge game map (2048 x 688 pixels). Our platform hero is called Zampo and takes the form of a little pink pig – and he is hungry as ever! The background story is that Zampo jumps around in the idyllic world of Suinio. Unfortunately, a terrible calamity plagues Suinio as all the normal sized toilets have been stolen by the Evil Masters. The witch Cotechina have hit them with a spell that smashed them into 35 little potties that need to be transformed back into normal-sized toilets… Sounds confusing? Don’t worry too much, I was a little mystified too by the background story as this is the first Retreum game I’ve played. The aim of the game is to steer Zampo around the world and collect potties and get to the exit. Zampo moves around by using the joystick (jump, right, left and duck) and pressing the Fire button will initiate a so-called Turbofart which will boost his speed and make him reach otherwise unreachable areas. Charging the Turbofart level can also be achieved by catching Gasorade bottles which are scattered around the magic world of Suinio. As Zampo is a pig, he is also constantly hungry and to avoid starvation, he has to eat – if not, he dies (pretty tough life he has going…). 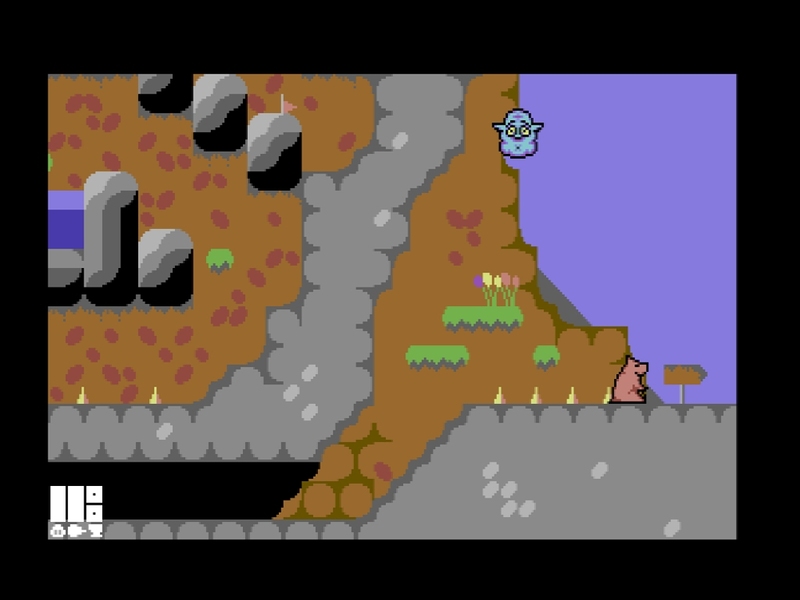 A HUD is displayed at the bottom left side of the screen and indicates the current hunger state (Belly Satisfaction), amount of Turbofart charge and the number of potties left. To keep him from starving and raising the Belly Satisfaction level, different food items can be collected in the form of fish, sandwiches, spinach cans, and watermelons. Eating spinach will bring Zampo into the pig-of-steel mode for 10 seconds, making him greyish-blue and able to kill his mortal enemies, the Evil Masters (Huenison, blue head, frog monster and skull) by touching them. A successful Evil Master kill will fully replenish his Belly Satisfaction level and Turbofart gas. On Zampo’s quest, glass barriers may block his way. They can be opened by stepping on a connected switch which can be placed nearby or even at a distant section of the map (no one said it should be too easy, right?). Zampo can also freely teleport around the huge map of Suinio and reach places that are normally inaccessible. When at a portal, pressing and holding fire will start the teleportation. He can then move freely around until he reaches a completely non-solid place where no obstacle can block him. But remember to use the portals wisely as they can only be operated once! Small flags represents checkpoints and are also scattered around the world. The checkpoints are activated by stepping on them and whenever Zampo steps on a spike, falls into water or touches one of the Evil Masters that wander around randomly, Cotechina the witch will make him respawn at the last checkpoint. The center of Zampo (the space between the legs) acts as the contact point with platforms, as the paws-platform collision detection is not pixel-perfect, but character-based. Furthermore, the character is constantly affected by gravity, so it progressively slows down when going up and accelerates when going down (with sub-pixel precision!!) – the attention to detail is absolutely breathtaking! The game has only one level, but it is quite large at 2048 x 688 pixels. When all 35 potties have been collected, following the exit sign at the lower right corner of the map, will finish the game with the text ‘Well done! The quest continues…’. The game is available as a download on the itch.io page (link) and with a price tag of 2$ the cost is very reasonable. The price is a minimum and more dollars can be added during the purchase. After payment, the game can be downloaded in various formats for the Commodore 64 or as a Windows installer (with the VICE emulator). For the Commodore 64, the game comes in formats supporting the Commodore 1541 drives & SD2IEC devices (.d64) and EasyFlash & 16kB cartridges (16kB). It can also be used in concordance with fast loaders and it is VSP-crash free. 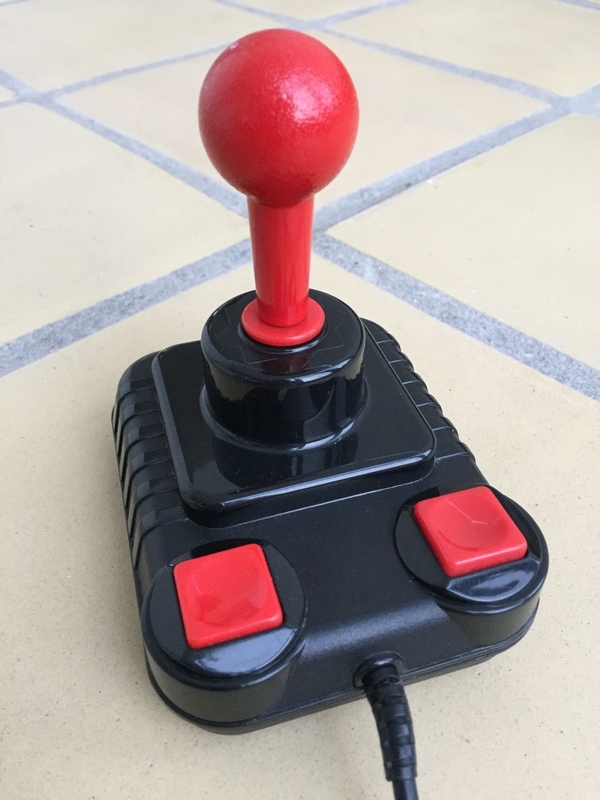 I simply copied the .d64 file to my 1541 Ultimate II (link), attached my beloved ZipStik (link) to joystick port 2 and forgot all about real life issues for several hours! The game is developed for PAL and should only be played on that hardware. It can also be played on NTSC gear but the game runs slower as the multiplexer relies on a complete update which takes two NTSC frames instead of one PAL frame (i.e. approximately 0.033 seconds instead of 0.020 seconds). Thus, the game runs about 67% slower on NTSC as compared to PAL gear. This may cause sprite flickering, tears showing at the bottom of the screen and music not being played correctly. There is a secret hidden in the game! By sitting down on the tombstone, with the picture of a face, in the lower left corner of the map makes Zampo changes color (yellow) and enemies can’t hurt him anymore. Furthermore, it also makes him run faster and jump further which makes passing several sections of the game easier as no farting is needed… The secret is a tribute to the arcade version of Ghosts ‘n’ Goblins in which the player can be awarded a golden armor from the last tombstone in the first part of the game (the secret in Ghosts ‘n’ Goblins can be unlocked by repeatedly hitting fire when the timer is below a certain value). 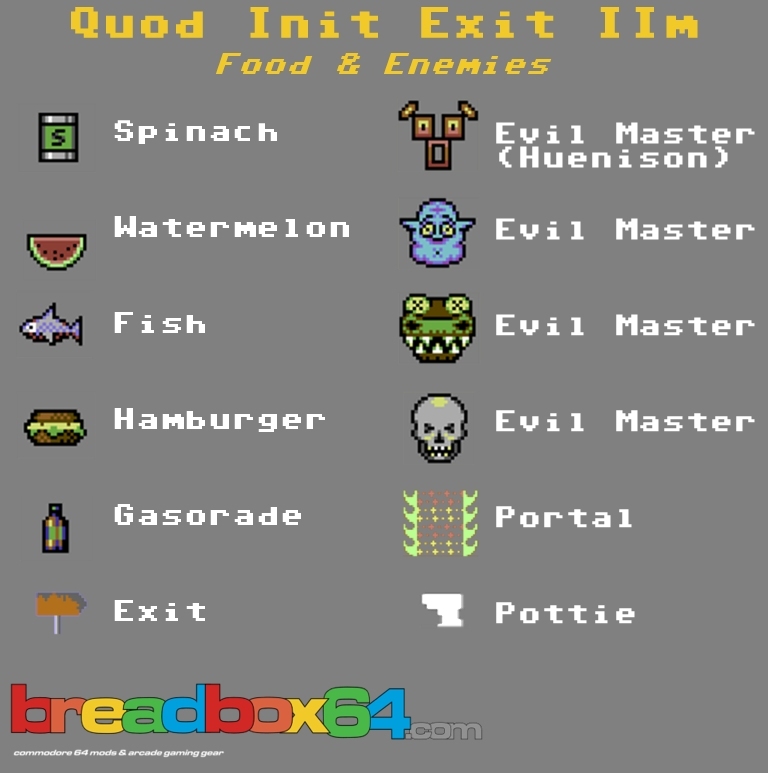 According to the manual, Quod Init Exit IIm is based on a very complex joke among the game developer and his Italian friends and is Latin for ‘Whatever goes in, comes out’ as described earlier. This made me wonder if there were other semi-hidden meanings in the game and guess what – I may have found a few candidates… First up is the idyllic world of ‘Suinio’. If the last ‘i’ is removed in the name, it simply means pig in Italian. Secondly, our pink little friend is called ‘Zampo’ which is the first person singular present indicative of ‘zampar’ meaning to eat or drink rapidly in Italian. Secondly, our pink little friend is called ‘Zampo’ which is derived from ‘zampa’, which means ‘paw’ and is apparently one of the key elements of the inside joke (thanks, saimo!). The witch is called ‘Cotechina’ and her name is pretty close to the Italian word ‘Cotechino’ (with an ‘o’ in the end) which is the name of a traditional sausage made from…well, pork of low quality! Finishing the game was quite a challenge and this is meant as a very positive thing. I found the leaping from platform to platform a little frustrating at first. I may even have yelled at the screen when being sent back to the last checkpoint for the 23rd time… However, balancing the difficulty of a platformer is always difficult. Making it too easy would have affected the ‘feel’ of the game in a negative direction. Nevertheless, attaining sufficient jumping skills required some practice, but I eventually got it and the moments of frustration were significantly reduced. According to the game’s homepage, it should take the ‘average user’ approximately half an hour to complete. Well, I guess I’m not the average gamer as I kept playing this game for hours. 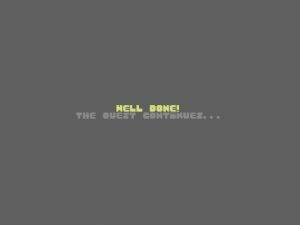 The game may be a little short compared to the original game of Quod Init Exit, but it is certainly not dull nor un-inspiring. I never experienced getting stuck, unable to move or not knowing where to go next. It took me a while (and a quick internet search…) to find the hidden treasure of the game. 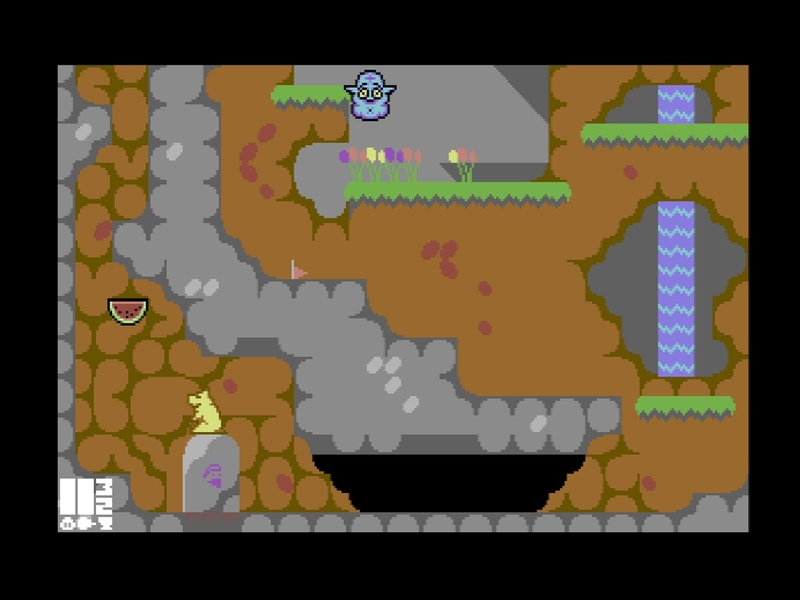 The graphics of Quod Init Exit IIm are stunning, the animations are smooth and it certainly does not look like the average Commodore 64 game. The fact that the entire screen follows/scrolls smoothly to the movements of our little piggy friend, while maintaining a steady HUD, is amazing. At a minimum price of 2$ it is certainly not be the price tag that should be the excuse of not giving this little gem a go. It is certainly a nice addition to any Commodore 64 gaming library. Kudos to Retream! Cannot wait for the upcoming extended version called Quod Init Exit IIo in which the ‘o’ is short for ‘opimus’ as in fat… Gotta love them Italians! I supported the developers and purchased my copy of the game on itch.io (link) – didn’t want to be lame for 2 $!!! However, during the review, I had access to a mega-trained version of the game cracked by TRIAD. By cheating, I was able to uncover the entire world of Suinio and reach the end of the game in a reasonable time – I know, shame on me! 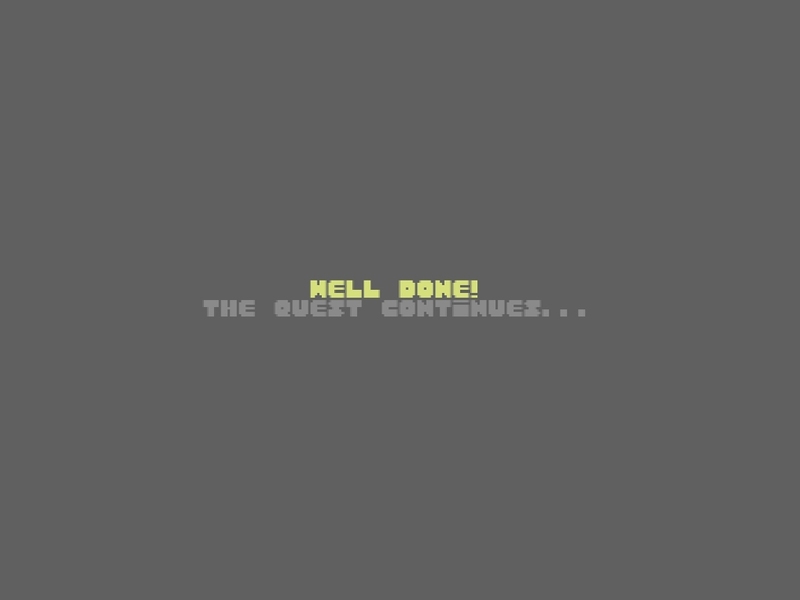 However, I am currently on a quest to finish the game untrained!